This elegantly designed sanctuary nestled beneath magnificent Beech trees creates an idyllic escape for the whole family to enjoy. The Garden Hideaway has been designed as a fantastic space to entertain friends, for family to relax together and for the children to enjoy. From a sunken fire pit to a child’s tree top look out, Garden Hideaway has something for everyone …. All of these elements have been brought together in perfect harmony, with a cosy tree house cabin offering ample seating and storage and a wood burning stove to keep you snug and warm during those cold winter months. The outside deck and sunken fire pit are perfectly positioned under the leafy Beech trees, offering truly breath-taking views of the client’s luxurious garden and natural swimming pool. Set beneath the magnificent Beech trees, a perfect place to relax and unwind …. A gorgeous rope bridge extends from the outside deck to a children’s deck with it’s own crow’s nest deck above, sand pit below and various rope ladders creating the perfect play area offering hours of endless enjoyment for children of all ages! The Garden Hideaway brings to life the epitome of outdoor entertaining and luxury, within the serene, tranquil setting of the beautiful Beech trees of this exquisite natural garden in the North West of England. For anyone who has ever wondered if you could bring the adventure of a safari to a comfortable family home: Blue Forest presents the Safari Style Treehouse. The Willow Nook Tree House is the perfect luxury hideaway for spending quality time while relaxing and playing in comfort. Hidden away in the client’s garden, the tree house sits raised near the feature hot tub, all of which are accessed via a wooden walkway. Every child dreams of a magical hideaway like The Enchanted Hideouts. 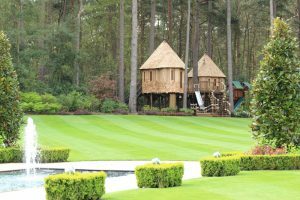 Made up of two fairy-tale inspired treehouses linked by an adventure trail below and a rope bridge above, this is the epitome of childhood play areas.